An anabolic and anti-catabolic powerhouse for being used before, during, and post-workout, or at any other time of the day when you need a boost of anabolic amino acids. Unlike BCAAs, EAA Xtreme does not only stimulate your protein synthesis maximally, but will also provide you with all the building blocks you need for a maximum muscle growth. Why is EAA Xtreme far superior to BCAAs and Whey Protein - especially during the critical Times before, during and post-Workout? Recently, more and more people are saying that BCAAs are completely useless and that whey protein is everything you need for an optimal protein supply during the critical timeframe around your workout. Even if there could be a grain of truth in this statement, it represents a far too simplistic generalization, which does not correspond to the facts. To understand this better, you need to know what is going on in your body during and after a hard and intense workout, and what the benefits of providing your body with amino acids during that time are. While it may be clear to most trainees that muscles do not grow during exercise, but during the post-workout recovery process, many are not aware of the fact that during hard and intense workouts, an exercise induced protein degradation initially creates a catabolic environment in which certain amounts of muscle protein are broken down and metabolized. This catabolic state persists for a while, even after your workout, before proper anabolic post-workout supplementation or other food stimulates your muscle protein synthesis. This stimulation will finally result in repair of damaged muscle fibres and new muscle growth. In other words, you first have lose some muscle mass before you build more muscle mass. By using a targeted supply of amino acids before and during your workout, you can mitigate this catabolic environment greatly and in an ideal case even completely prevent it. Among other things, the stimulation of your muscle protein synthesis by BCAAs and in particular leucine via an activation of the mTOR pathway comes into play here. This does not only mean that you will not lose muscle during very hard and intense workouts, it also means that the anabolic environment that normally develops some time post-workout will occur faster - ideally already during your workout. As a result, your recovery will be greatly accelerated and you will build more muscles. And at this point, EAA Xtreme is vastly superior to both BCAAs and whey protein. Although the BCAAs traditionally used for this purpose will stimulate your protein synthesis, they do not provide your body with the building blocks it needs to ultimately be able to produce protein. It's like having a team of craftsmen, but not giving them any tools or building materials - in the end, not much will happen. 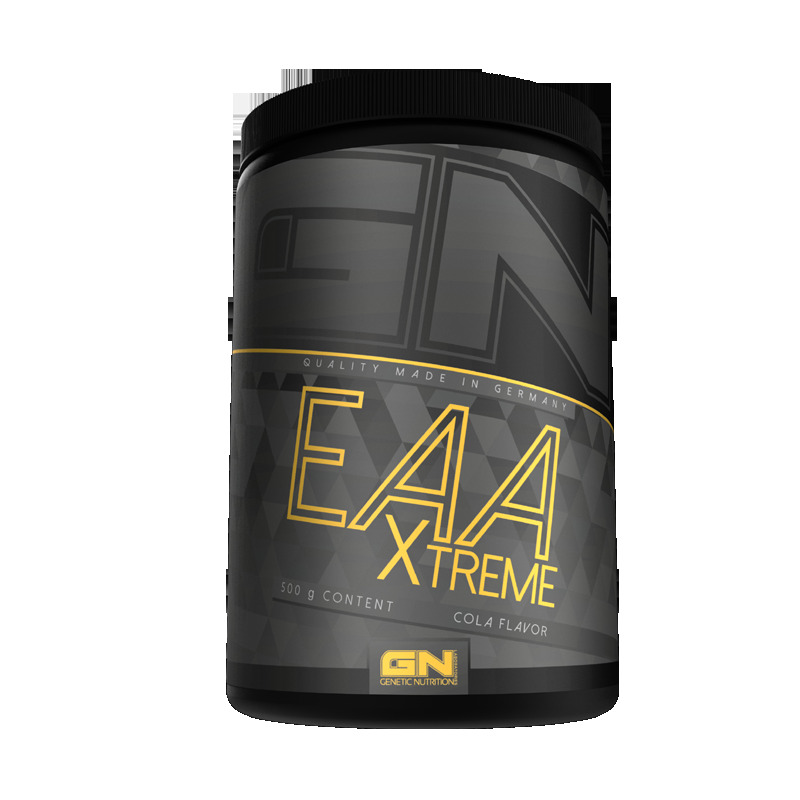 However, EAA Xtreme will provide your body not only with the BCAAs that are so vital for inducing your body’s protein synthesis, but also provide all the essential amino acids your body needs to make new protein, which will have dramatic effects on preventing a catabolic, muscle-degrading environment. At this point, some critics may argue that instead of EAAs, one could also use fast digestible whey protein, which will provide both BCAAs and all essential and nonessential amino acids. However, these people overlook the fact that EAAs, especially in the critical timeframe around your workout, will bring about decisive advantages over whey protein. This is primarily related to the fact that your body must first digest protein in order to benefit from the amino acids contained – and this is also true for fast digestible whey protein. And this digestion brings with it a whole series of disadvantages. First of all, whey protein will stress your digestive tract much more than free EAAs, which can be absorbed by your body directly and without any previous digestive process. For sensitive people, consuming whey protein just before and during a hard and intense workout can lead to a feeling of discomfort and, in the worst case, even nausea during exercise. In addition to this, your body will need to channel more blood from other areas into your digestive tract for the digestive process, so this blood will not be available to supply your hungry muscles with much needed oxygen and nutrients during exercise, which may affect your exercise performance. The next disadvantage is that the amino acids present in whey protein will enter your bloodstream much slower and over a longer period of time because of the longer duration of the digestive process. Although whey protein is digested faster than slowly digesting casein, it will take longer than with EAAs until the first amino acids will arrive in your blood stream blood, and you will also never reach the extremely high an amino acid concentrations in your blood, you will reach by using free EAAs. Such a rapid and, above all, large increase in your blood levels of amino acids is not only important for providing your muscles with much-needed amino acids as quickly as possible during exercise, but also to maximize the stimulation of protein synthesis and thus the anabolic response. This is primarily due to the fact that the degree of stimulation of your protein synthesis does not depend on the total amount of amino acids present in the blood, but on the speed of the increase of the amino acid concentrations in your blood stream. In other words, a rapid and strong increase in blood amino acid levels will result in a much greater stimulation of your protein synthesis than a slow increase. And it is precisely this fast and strong increase in blood amino acid concentrations that you will achieve with EAA Xtreme! Why is EAA Xtreme ideal for supporting Diet and Contest Preparation? The benefits of EAA Xtreme are not limited to before, during and post-workout. You can also use EAA Xtreme at any other time of the day when you need an anabolic and anti-catabolic boost. This can be invaluable, especially during diet and contest preparation. 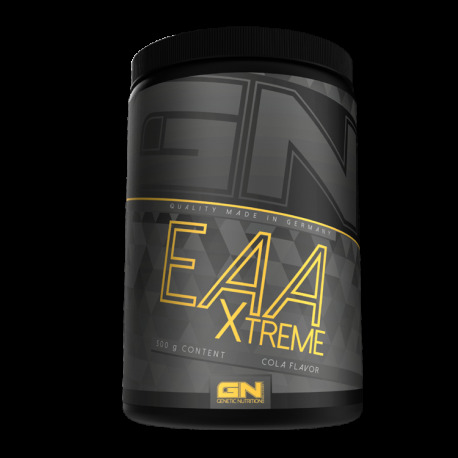 Because EAA Xtreme provides you with the essential amino acids in concentrated form, it will give you an anabolic and anti-catabolic support with minimal calories between meals. Additionally, the ingredients that support your focus and ability to concentrate can help you overcome the dreaded diet-related lethargy and listlessness that are otherwise almost inevitable during a severe calorie-restricted diet. But that's not all. A whole range of ingredients of the EAA Xtreme Matrix promote the preferential use of body fat for fuel - in other words, you will burn more fat. And it is not without reason that both green tea extract and an extract of green coffee beans with its very high content of chlorogenic acid are among the most popular and effective natural non-stimulant ingredients for supporting fat loss. Why is EAA Xtreme superior to most other EAA Products?  Other companies would probably have stopped after compiling an ideally combined EAA blend, but we would not be GN Laboratories if we had not done everything to further optimize and expand such an EAA mix for intensively exercising strength athletes. As the name EAA-Xtreme suggests, our unique matrix includes much more than just the EAAs and BCAAs that are so vital to muscle building and recovery. The EAA-Xtreme Active Ingredient Matrix also includes a host of other ingredients in optimal amounts and ratios that work synergistically together and mutually reinforce each other to give you more intense and tougher workouts while maximally promoting your recovery between sets and post-workout and creating an anabolic environment in your body to allow you to build maximum amounts of lean muscle mass. This unique matrix also includes ingredients that will intensify and maximize your focus and concentration during your workouts without unwanted stimulant related side effects, as well as other ingredients that promote the use of body fat for fuel during your workouts, to not only provide additional energy, but also to aid burning the last bits of unsightly body fat that could mask your rock-hard muscles. The so-called EAAs, which stands for essential amino acids, are the 8 essential amino acids that your body can not produce itself and that have to be supplied through the diet or in form of supplements. From these 8 EAAs, your body can make all the other amino acids that it needs. These 8 EAAs also include the 3 branched-chain amino acids leucine, isoleucine and valine known as BCAAs, whose almost innumerable benefits are briefly described in the following section. Compared to supplementing with only BCAAs a supplementation with EAAs has the great advantage of not only providing all the benefits of the contained BCAAs, but also providing your body with all the amino acids it needs for recovery and building new muscle mass. In fact, scientific research has shown that supplementing with EAAs, especially during the critical phases before, during and post-workout, can significantly increase the body-wide nitrogen retention, which means nothing less than an increase in muscle mass. When used before and during your workout, EAAs can effectively prevent the otherwise inevitable catabolic environment from occurring during hard and intense workouts, which not only means that your valuable muscle mass will be effectively protected from any degradation during brutal workouts, but also that you can quickly restore a strong anabolic environment post-workout that can dramatically accelerate your recovery and your gains. In contrast to BCAAs, EAAs will provide you with everything you need for maximum gains of lean, hard and defined muscle mass, including all the building blocks needed for the actual synthesis of muscle protein. The three branch-chained amino acids known as BCAAs have a wide variety of benefits for every athlete and dieter, which are so diverse that we can only mention the most important of them in a nutshell. BCAAs can significantly increase your exercise performance in strength and endurance sports of all disciplines, greatly accelerate and optimize your recovery during and after exercise, reduce exercise and diet-induced increased catabolic cortisol levels and thereby protect you from muscle losses, reduce muscle soreness after intense workouts and even increase your testosterone levels after exercise. However, one of the most important features of BCAAs is the stimulation of the mTOR pathway, which results in a large increase in protein synthesis that will ultimately leads to faster and more extensive gains of mass and strength. Of course, we use the proven and scientifically supported 2: 1: 1 ratio of leucine: isoleucine: valine. L-tyrosine is a naturally occurring dietary amino acid, your body needs for the production of important hormones and neurotransmitters, which include thyroid hormones as well as the two strongest naturally occurring neurotransmitters, adrenaline (aka epinephrine) and norepinephrine. Since these two neurotransmitters will stimulate fat burning, tyrosine will not only help you gain more energy through its stimulating effect, but will also have a glycogen-sparing effect, as more fat is used for fuel during your workouts. This will leave you with more glycogen as an energy source for more intensive and longer workouts. L-histidine is a naturally occurring dietary amino acid that is urgently needed for post-workout tissue repair and plays a crucial role in protein synthesis and muscle growth. In addition, histidine increases the natural activity of nitric oxide and can thereby promote an increased blood flow to your hard-working muscles, as well as a better pump during exercise. Cysteine belongs to the group of sulfur-containing amino acids and represents an important component of the two strongest and most effective endogenous antioxidants glutathione and glutathione peroxidase. Without sufficient amounts of cysteine you will not have optimal levels of these important antioxidants, which will impair your post-workout recovery. Similar to taurine and creatine, l-glutamine is able to increase the volume of your muscle cells by fluid retention, which can increase your strength due to improved leverages and will have a direct anabolic effect via an increase in protein synthesis. In addition, glutamine can increase your exercise performance by increasing and accelerating your glycogen resynthesis and promoting and accelerating your post-workout recovery. During exercise, glutamine can prevent an exercise-induced catabolic environment, protecting your muscles from any breakdown. As an added bonus glutamine can boost your immune function, which is severely compromised after hard and intense workouts, protecting you from unplanned illness-related off times. In addition, scientific research has shown that glutamine can increase your growth hormone secretion by up to 400%, if taken on an empty stomach, which will mean a better and faster recovery and faster gains of muscle mass. Taurine is a naturally occurring amino acid that can increase the workload of your muscles, increase your exercise performance, and significantly delay the onset of fatigue. This is amongst other things due to the fact that taurine is able to increase the hydration of your muscle cells, helping them to perform better. Since taurine stimulates fat burning, this amino acid can not only accelerate your fat loss, but also exhibits a glycogen-sparing effect, which can allow you longer workouts. In addition, taurine can significantly accelerate your recovery, as it is an effective antioxidant that can protect your muscles from damage caused by free radicals during exercise. Interestingly, it has been shown that a combination of taurine and the BCAAs contained in EAA-Xtreme can support your recovery better than BCAAs or taurine alone. L-alanine is a naturally occurring dietary amino acid that has been scientifically proven to help maintain or even increase blood glucose levels during exercise, resulting in consistent exercise energy. In addition, alanine can stimulate and promote your protein synthesis. During intense workouts, you lose fluid and important minerals through your sweat and a slight deficiency of these important electrolytes as well as a minimal dehydration of just 2% are enough to severely affect your workout performance. That's why EAA-Xtreme contains a complete electrolyte blend, combined with a natural coconut water extract that is rich in minerals and trace elements, to replace any loss of minerals as quickly as possible and to maintain an optimal hydration of your muscles. Extract of Green Coffee Beans (standardized to 50% chlorogenic acid) Our green coffee bean extract not only provides a well-tolerated source of caffeine, which can increase your mental focus and exercise energy, but is also rich in natural chlorogenic acid. Chlorogenic acid has a number of properties that can help you to reduce your body fat and inhibit a fat storage. Particularly interesting is the ability to significantly increase the amount of fat your body uses for fuel. This results in a glycogen-sparing effect that can allow you harder and more intensive workouts – especially during a calorie reduced diet. Green tea extract contains a variety of healthy polyphenols that can help reduce to body fat in various ways. In addition to this, green tea extract is also a natural source of caffeine. Green tea stimulates fat oxidation, which results in your body using more fat for fuel. This not only promotes a loss of unsightly body fat, but also spares your muscle glycogen stores, resulting in more energy for longer workouts. Choline bitartrate serves as a natural source of choline for your body, which is needed for the production of the neurotransmitter acetylcholine. Acetylcholine helps your nerve cells to communicate with each other and can significantly increase your focus and concentration during exercise. Niacin is an essential B vitamin that your body desperately needs for his energy production and that can help you to increase the working capacity of your muscles. In addition, niacin has a pronounced blood flow promoting effect, and an increased blood flow to your hard-working muscles is synonymous with a better supply of essential nutrients, oxygen and endogenous anabolic hormones. Vitamin B6 is needed by your body for virtually all functions of the protein metabolism, which means in other words that without vitamin B6, neither recovery and rebuilding of damaged muscle fibres after exercise, nor muscle growth will be possible. Da EAAs meist nicht so lecker schmecken wie BCAA finde ich hat gn dass super hinbekommen. Eistee Mango schmeckt für mich sehr lecker :) teste weitere Geschmacksrichtungen. Recommended daily intake: Add 20 g powder to 200 ml cold water and shake it.